Former fire-eater and founder of Cirque du Soleil Guy Laliberte has booked a place for this September, becoming possibly the last space tourist for many years. 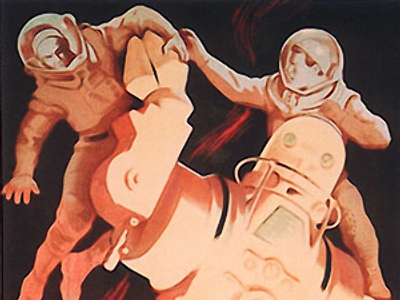 Speaking with RT, he compared cosmonauts to street artists. His last name means – “freedom” in French. His first name represents ‘guide’ or ‘leader’. Guy Laliberte. From now on he will be part of space history as the first Canadian space tourist. But the world is likely to remember him as number seven – the seventh eccentric who made his dream come true. The seventh and the last for some time, as the future of space tourism appears vague, after the Russian Space Agency said all trips to the ISS after 2010 will be professional-only. His path to weightlessness hasn't been easy. As a teenager he played the accordion and harmonica. By his 20th birthday he had learnt the art of fire-breathing and stilt-walking, determined to pursue a career in the performing arts. Today, almost 30 years later, he is a billionaire on the Forbes list of the world’s richest people, best known as the founder of the world-famous Cirque du Soleil – a mix of traditional circus arts and street entertainment. In 2004, Time magazine ranked him as one of the 100 most-influential people in the world. Laliberte is also renowned for being a high-stakes poker-player. Whether his career and personality will make him stand out as a space tourist – remains to be seen. But he has already committed to using his space mission to promote a humanitarian cause: the critical water situation on planet Earth. Using the motto “Water for All, All for Water”, he promises to be creative in presenting his message: One drop, one planet, one message. RT caught up with him in Moscow, minutes after he was presented to the public as the next private space explorer. RT: You've been saying that you are very proud to be the next space tourist, but what was the emotion when you realized that you are actually going to the orbit for real? G.L. : You know, actually, the most important phase for approbation for training is the GMK, which is a medical board which happens after you go through two weeks of pretty intensive and invasive verification of your body, brain – every aspect of my health. This was more a relief than an emotion, because it is so intensive, and first what you want to do is to start training as soon as possible. I will go to a training phase which is one of the smallest one, shortest one in all space traveling. You have to understand that there is a critical day when you are reviewed medically. You don't want to fall off your bicycle and hurt or break a leg or something like that. So there are still a lot of unknowns before and reserve, and level of approbation before I will depart on the Soyuz capsule. RT: So the tears of happiness will be saved for landing? G.L. : I don't know what it would be. I think it will happen probably more when you see your family and kids before the departure. I've already had some emotional buzz just thinking about it. And I think it’s normal. RT: How has Russia been meeting you and treating you? G.L. : Everybody here has been treating me amazingly, over and beyond my expectations. Starting from the Russian Space Agency even to the medical things, everyone has been very nice to me, helpful. I have met different-level people; I've been able to tell them about my mission; they've been very supportive. And mostly my cosmonaut friends that I met so far, even my commander. They are so generous with their experience and advice. Really there is a small community worldwide, there is no more than 300-350 space travelers. And I found in that community the same deepness and commitment to friendship that I had when I was a street performer and I lived on the street when I was very young. This was my happy surprise when I came here. RT: You've been to Russia many times. But have there been any illusions or stereotypes that you have seen dispersing this time? G.L. : First time I came here was in 1986, and it was back in Soviet Union. And already there I noticed an engaging relationship in terms of friendship in a way that is typical for Russia. There is nothing like Russian friends. I feel easy, I feel comfortable. Of course it’s a different culture but I'm used to traveling around the world and to adapting to culture. I can't wait that I'm able to communicate more in the Russian language, which would probably be the most difficult thing in my training. But I respect the Russian population and the Organization that is receiving me – I'll do my best to talk to you in Russian next time. RT: What is the most interesting thing about training? G.L. : I think everything is exciting. I feel like a little kid. This is all new for me. I've been doing Cirque Du Soleil for the last 25 last years. We master the art of doing a great show. We always have to go through great technical challenges during the show. But this is another challenge, this is a new feel of learning experience and it arrived at the right time in my life, I will be 50 in September, and I need a personal challenge and I got it here, so I can't ask for better. RT: Have there been any great cosmonaut that you've been looking up to since your childhood? G.L. : I have to admit that as a kid, the first name I heard was astronaut Armstrong. And of course he was an idol. This was the moment where, as a child, you realize that your storybook at night could be a real adventure. He addressed the public saying he was at the right time at the right moment. This is the breed of the greatest. This is an example for me. RT: Do you feel that there might have been a better way to invest your money into the cause you're fighting for – into water- on the Earth rather than going to space? G.L. : Actually I'm spending a lot of money here on Earth beside the price of the trip cost for space. I already have committed $100 million directly to my foundation. And we are raising more money. Already I warn my kids that if I die, 80 % of my fortune will go to my foundation for helping people in need. And I truly believe that the money I spend there will fulfill the personal dream that I have, but it will be great support to commercial awareness of Cirque du Soleil and the awareness I want to create for the water cause in the world. Because if we achieve the artistic goal that I have on my mission, the coverage of that worldwide will be worth much more than the money that I'm spending there… So I think it’s a good investment for the cause of water.